I feel the familiar skipping of my heartbeat, the flush of embarrassment, fear. Last Saturday. Can I even remember yesterday? Elizabeth is Missing has been a novel that I have seen talked about and reviewed a lot of late. I am not one to jump immediately on to literary bandwagons – but from the first review I saw of it – I knew I wanted to read it. Since then, Emma Healey’s debut novel has been longlisted for the Bailey’s women’s prize, a good time to finally get down to reading it. (Talking of literary bandwagons – I have just started reading My Brilliant Friend by Elena Ferrante – I am I know a little late to that particular party. Still – I get there eventually). Elizabeth is Missing is a poignant, thought provoking novel of memory loss, and ageing, it is an engaging easy read, with a memorable central character. We live in a rapidly ageing society, and so the themes of the novel are ones that may affect many of us in one way or another – that in itself can be an uncomfortable feeling. I think to some extent we all fear the prospect of some aspects of ageing and the loneliness that come with memory loss and confusion – and in this novel Emma Healey explores this difficult subject with sensitivity and understanding. ‘You know there was an old woman mugged around here?’ Carla says, letting her long black ponytail snake over one shoulder. ‘Well, actually, it was Weymouth, but it could have been here. So you see, you can’t be too careful. They found her with half her face smashed in.’ This last bit is said in a hushed voice, but hearing isn’t one of my problems. I wish Carla wouldn’t tell me these things; they leave me with an uneasy feeling long after I’ve forgotten the stories themselves. I shudder and look out of the window. I can’t think which direction Weymouth is in. Maud is an eighty-two year old woman living alone, a widow with one middle-aged daughter Helen; living nearby, and a son in Germany. A carer, Carla comes in, bringing with her prophecies of doom from outside, news of muggings and so on, and Helen is in and out all the time, because Maud has gradually become in need of more help and support. Forced to give up volunteering at the charity shop, Maud has been struggling with her memory for some time. The cruel fact of the matter is that Maud has dementia. Maud buys tins of peaches, there are notes pinned up in the kitchen reminding Maud not to buy any more peaches and not to use the cooker. Carla reminds her somewhat archly to try and not eat her lunch before 12.00, but Maud makes herself tea that goes cold, and plates of toast she has no need of as she has just eaten, and going into the corner shop where she was once served by the current owner’s mother, she forgets what she wanted, and buys peaches. Now out of the fog of her confusion, Maud keeps coming back to one thing that her friend Elizabeth is missing. No one it seems will take her seriously, not Helen, or Peter; Elizabeth’s grumpy seeming son, nor the doctor or the police. Elizabeth was the friend Maud made after her husband’s death, the one she had fun with, started volunteering with, and went on holiday with. Elizabeth’s house now stands apparently empty, but Maud can’t remember when she last saw her friend. Maud is desperate to find Elizabeth; Maud’s pockets become filled with bright scraps of paper with notes written to herself about Elizabeth, jotted down in moments of clarity to aid her in her moments of desperate confusion. There is another mystery at the centre of Maud’s story¸ one that has remained unsolved for seventy years. Although Maud struggles to remember whether she has eaten that day, her memories of the past are becoming sharper. As Maud tries to discover the truth about her dear friend Elizabeth, memories of the past are triggered. Memories of when Maud’s elder sister Sukey disappeared not long after the end of the Second World War. In 1946 Maud was a teenager, Sukey a young married woman, living with her husband Frank, a removal man and black marketeer. Maud’s family had a lodger Douglas who was very taken with Sukey, and Maud’s young romantic imagination wondered whether there was any more to it than that, and she was apparently not the only one who wondered that, Frank was a very jealous man. Another strange character from those days looms large in Maud’s memory, a woman cruelly called ‘the mad woman’ by the locals. The one thing that I loved above all else in this novel – was that the novel is narrated by Maud; we see the world with all its difficulties, humiliations and griefs through her eyes. We feel her pain, her frustration and terror at the world around her, I have to say I loved Maud. Emma Healey has managed to get inside the mind of a frightened, elderly woman in a way that becomes almost unbearably poignant at times. 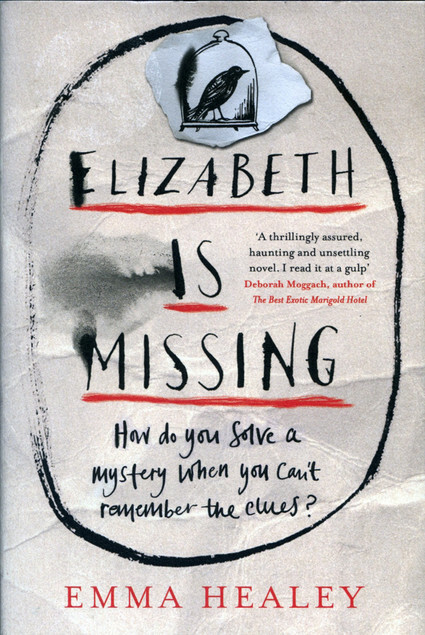 As a debut novel, Elizabeth is Missing is really impressive, I have no idea how well it might do in the prestigious Bailey’s Women’s Prize for fiction, as I have only read one other of the longlisted books so far. For me, the writing is good, there is a deceptive simplicity in the style and it is the themes and characterisation of the novel which makes it so particularly good. That was supposed to say plan on reading! Predictive text strikes again. 🙂 really hope you enjoy it. Lovely review, Ali. I enjoyed this novel when I read it last year. Maud is a wonderful character, isn’t she? As you say, Healey seems to have captured a sense of what it must feel like to live with dementia. Thank you. Yes Maud is a brilliant character. I haven’t read all of your review yet as this book is waiting at the library for me to go and pick up. I can’t wait to read it. Oh good hope you enjoy it too. Ali, I almost checked this out last week in audio to listen to on a trip. It sounds so good, but I think it might be too emotional for me as I just lost my mom last Sept. And we dealt with the memory loss for 2 years. Someday I might read, but not now. Yes, possibly the wrong time for you just now. I am pleased to hear you enjoyed this. I have read several positive reviews now. Dementia is perhaps not a subject I usually want to read about but I loved a previous read The Madonnas of Leningrad with a similar theme so I feel I might enjoy this too. The Madonnas of Leningrad is not one I had heard of. I bought this on a kindle special after reading a very positive review. I tend to avoid memory loss books but this one sounded too good to pass up. It certainly is good and well worth reading, hope it lives up to your expectations. I’m glad you enjoyed this one 🙂 I thought Healey gave an honest and respectful portrayal of dementia, memory loss and ageing. Like you say, she transports you into the mind of this frightened elderly woman which I thought was very well done. I’m looking forward to seeing what she writes next! Oh yes, so am I, she is an author to keep an eye on. I’ve shied away from this one because of the title, as I thought that was the name of the central character with dementia, and I was upset enough when I read “One Day” with the character of my exact vintage … Not sure I can face this one, as it’s something I fear so much. But I really found your review useful and interesting. Oh, I do want to read this now! I always look at the Bailey Women’s longlist but am, for instantce, a year behind on the 2014 winner. I wish I could keep up with this. I am fascinated by novels about ageing.